When you distribute your products and software updates with BLT for LabVIEW, it sends your program on a server that your end-user are able to connect so they can download the latest version of your application. This Product Updates Server is typically accessible over the Internet. By default, your Product Update Server is hosted by STUDIO BODs and everything is already configured properly, so you should not have to change the following settings. 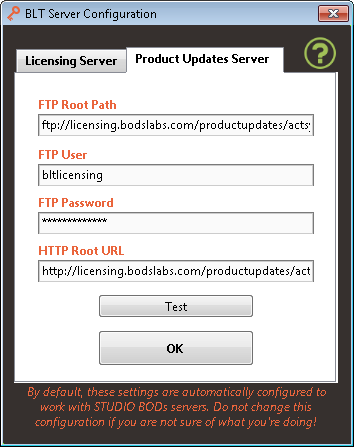 oFTP Root Path: This is the URL to the FTP folder where BLT for LabVIEW will store your product updates and installers. A hierarchy by ID_Product is automatically created under this path. oFTP User: Username used to connect the FTP server. This user must have full read/write access to the FTP Root Path on your server since product updated will be uploaded on this path via FTP. oFTP Password: Password to connect the FTP server with the provided username. oHTTP Root URL: HTTP URL to access publicly your product updates and installers. This URL must redirect to the same directory as the FTP Root Path mentioned. It will be used by your LabVIEW application to download available product updates.